As a family, we love greens. And we don’t mean salad greens (although we love them, too), we mean greens, kale, spinach, collards and chard. And one of the many blessing of northern California is that we can get almost any of the hearty greens we want, any time of the year. The cool, often foggy, coastal areas provide a consistent environment for growing most greens regardless of the season. We slow cook the heartier greens (see here for a recipe), but for the sweeter, more tender greens like spinach and chard, we often chose to cook “au gratin”. Au gratin simply means cooking a vegetable or protein with a top crust of breadcrumbs, cheese and/or butter, but most recipes these days also include a base sauce like béchamel. Gratins are easy to make, taste great and are also a way to introduce very healthy vegetables to doubting kids (and adults). 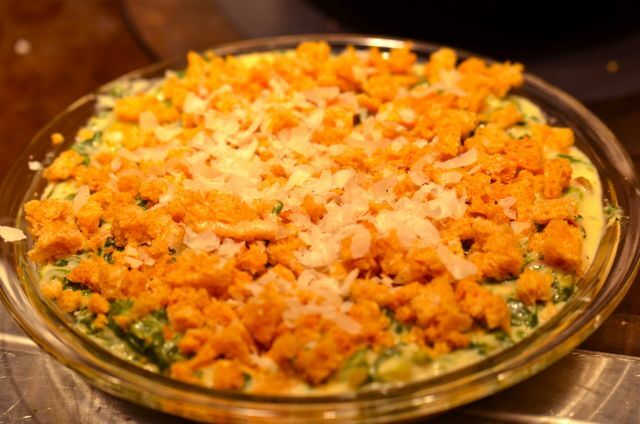 Our gratin of creamed spinach is one of our staple holiday dishes. Everyone loves it, it’s easy (we use frozen spinach), you can make a huge batch ahead of time, and the leftovers work with almost anything. 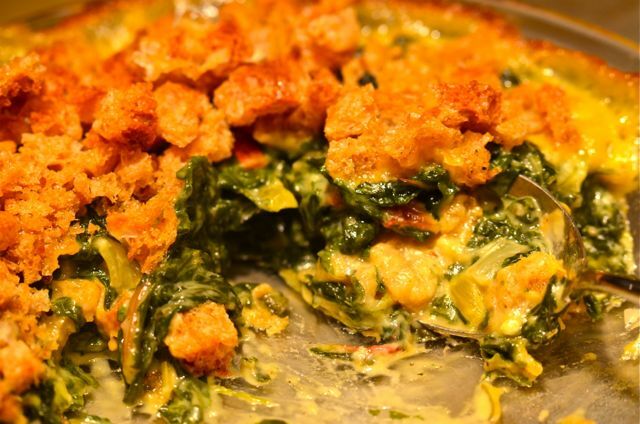 But for smaller meals, we enjoy making a gratin of sweet, nutritious chard. This dish isn’t just a way to use up some veggies, it’s a real treat. The key to the dish is the sweetness of the chard, while some of the hearty greens need a little help, chard is very sweet on its own. And that should not be much of a surprise, as chard is a close relative of the beet, which is also known for its sweetness. But unlike the beet, chard is all about the tender, nutritious leaves (and the stalks that are less reedy than most greens). The leaves and stalks are so tender that, rather than a long cook, a quick parboiling and sauté prepares them for cooking in the oven. You get all the flavor and nutrition of a heart green like kale, but in a little less time. The recipe we use is adapted from Alice Waters (not a surprise), her recipe is as basic as a gratin gets and puts the pure sweetness of the chard at the front of the dish. We add a little extra flavor with a sprinkle of parmesan and a grating of fresh nutmeg, we like the added salt and umami from the parmesan, but feel free to omit the cheese if you like. Otherwise the process is simple, cut off the big part of the chard stems them parboil the chard (in batches if you need to) for 1-2 minutes and then drain. Then melt some butter in a skillet, add the chard and cook for a few minutes, add some garlic and then some flour. 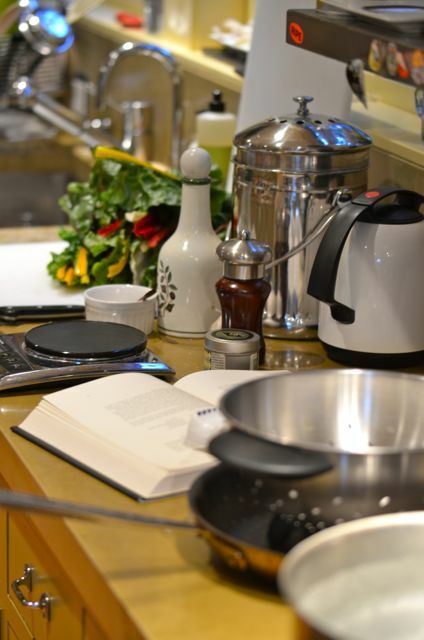 After you cook the flour for a minute, slowly add some warmed milk to create a béchamel. Season with salt, pepper and nutmeg and add some of the cheese. Then put the mixture in a greased gratin or pie dish, top with breadcrumbs and the remaining cheese and cook for 30 – 35 minutes in a 375 degree oven. And what you get is a sweet, creamy and crunchy batch of greens that almost everyone will like. The mix of flavors and textures is hard to beat. And the leftovers will also be great, but these greens are so good you may not have any leftovers. And what do we serve this with? Almost any roasted meat will do. The chard goes very well with roast chicken or pork, but we also enjoy it with roasted rack of lamb. The lamb with the chard gratin and a little red wine might be as good as it gets… at least until the next meal. 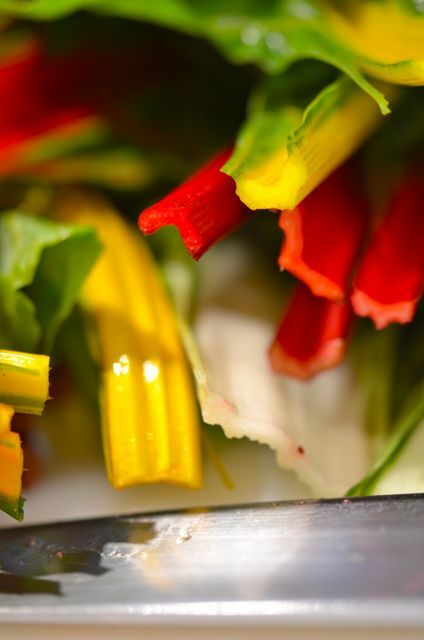 Chard is the same as “Swiss chard” or “Rainbow chard” and the color makes no real difference in the dish. Most chard stalks can be eaten if parboiled before further cooking. Just trim the largest / hardest sections of the stalk before cooking. 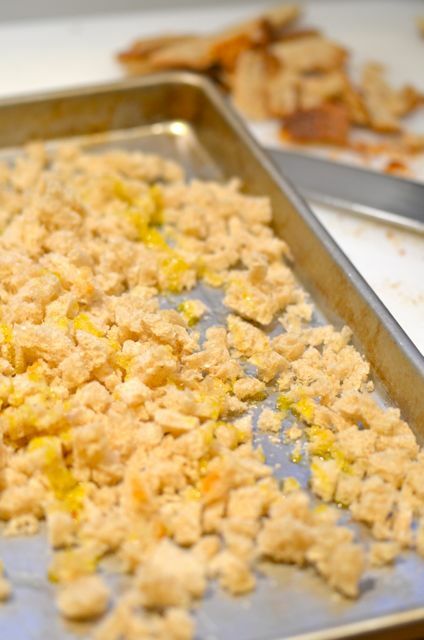 You can use store-bought breadcrumbs but you can also make your own. Just chop up a few cups stale bread and toss with some olive oil and a bit of salt. Cook in a 300 degree oven, tossing occasionally, for 30 minutes. What You Get: Sweet, tasty greens with a nice crunch. How Long? About 45 minutes to an hour, with 15 minutes of active time. The gratin can also be made ahead and reheated. Anytime dish. Preheat the oven to 375 degrees and bring a large pot of lightly salted water to a boil. Warm the milk in a small saucepan over very low heat. Wash the chard and cut off the tough end of the stalks. 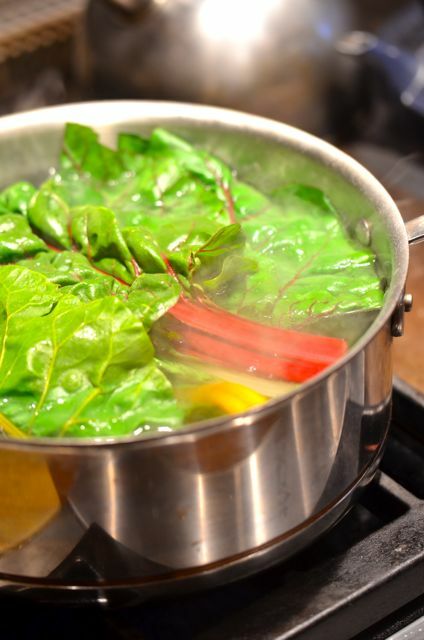 Parboil the chard in the boiling water for 1 -2 minutes, in batches if necessary. Let the chard cool and then drain and/or squeeze out excess liquid. Then roughly chop the chard. Heat a large non-reactive skillet over medium heat. Add the butter, and when melted, add the chard and cook until the chard wilts, about 6 -7 minutes. Add the garlic and cook until fragrant, another minute. Then add the flour and cook, stirring regularly, for another minute. Slowly add the warm milk, in 1/4 cup batches, until the milk is incorporated and the sauce thickens. Remove the skillet from the heat and add half of the parmesan cheese. Taste the mixture and season with the salt, pepper and nutmeg, to taste. 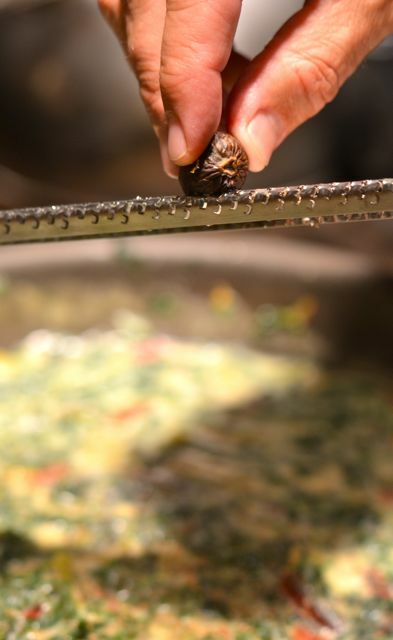 Pour the chard mixture into a buttered gratin or pie dish. The mixture should be about 1 inch deep. 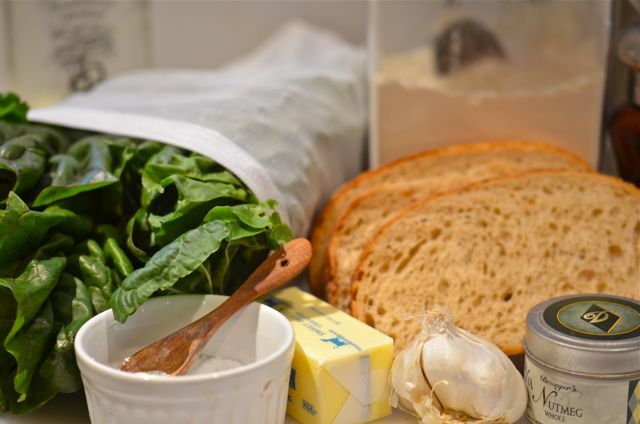 Sprinkle the breadcrumbs and remaining cheese on top of the chard. Put the gratin in the oven and cook until the breadcrumbs brown, 30-35 minutes. Remove from the oven and serve. Perhaps I’ll give that a try as I don’t have many good spinach recipes. Such a creative idea! A friend of mine made a gratin using beets that was really interesting. I would imagine that yours would have a similar earthiness, but less sweet than the beets. I have a bag of greens at home that just might get this treatment! It is a good cooking technique for greens. And the chard is very sweet…not as much as beets but you will taste the similarity.. It would! With a hearty stew or braise that would be a perfect plate! Beautiful photos! And Alice Waters is brilliant, so this must be wonderful (not that any of your recipes have ever looks less than wonderful)! Thanks! We lean on Alice Waters and Julie Rodgers (from Zuni in SF) quite a bit for veggie dishes- they know what they are doing and why reinvent the wheel? Love this simple recipe. You can always count on Alice Waters for recipes that really let the veggies shine through. This looks wonderful. Beautiful photos, too! I love chard. Wish I planted some in my fall garden! Oh, I am definitely making this! Just wishing my own chard was more plentiful right now (November in Eastern Ontario is a little slow on the garden front). Good advice. I’m a huge kale fan/consumer, and that would certainly apply! 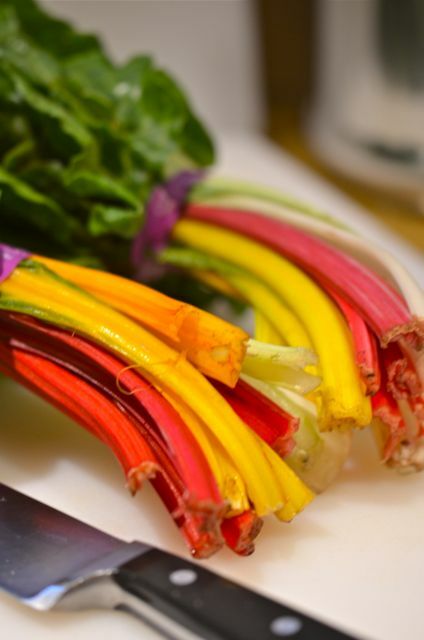 Yet another reason to move to California – year round chard! Although my Chard is still hanging in there (in VA). I’ll have to try this recipe out – I love the grated nutmeg idea! 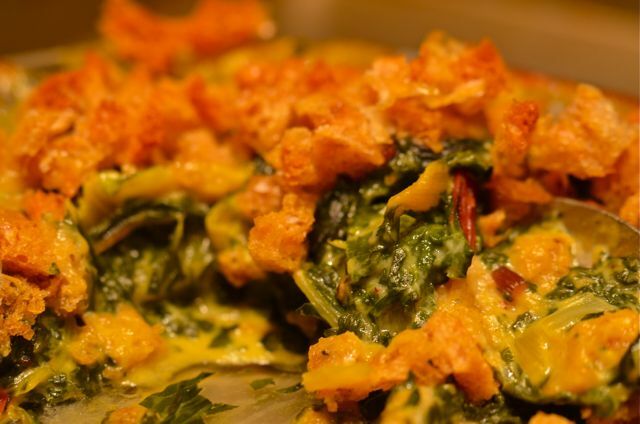 Chard is my favorite green, and I won’t say no to cheese and breadcrumbs. Great recipe! Firstly – some fab photos here !! and next up, loving the idea of adding breadcrumbs to the gratin. We are just entering green stage in the garden – chard, spinach and greens of any other name !! Thanks! And we hope you enjoy the greens! This recipe is worth making- very tasty! LOVE THIS! Only started liking greens a few years ago and always looking for new ways to cook. Most often I just saute with garlic and olive oil or chop and toss into soups/stews. Can’t wait to try this recipe! Hope you enjoy it! The same basis method works for most greens, some need extra blanching, some less…but once you have the recipe it works all the time! Thanks! It is worth a try, very tasty!